We perform Stereotactic Biopsies under local anesthesia with or without intravenous sedation. Most of the biopsies are performed with CT localization, however, in cases where the lesion can only be seen on MRI we have facilities to do MRI guided biopsies. The procedure takes about 3 hours. To begin with a stereotactic frame is attached to the patient’s head using local anesthesia at the pin insertion site. This works as a reference for all scans (CT, MRI and PET) which are used for target localization. This system allows computerized planning of the surgical approach with sub-millimeter precision. A CT/MRI scan is then performed to obtain the co-ordinates. In the operating room, the patient’s head is rested on a clamp system in a comfortable position. A small linear incision is made on the scalp and a small hole is drilled into the skull. A reedy biopsy needle is put into the brain using the coordinates obtained by the computer workstation. This is less invasive and much more precise than an open biopsy that requires a craniotomy which involves removing a piece of the skull in order to get access to the brain. The specimen is then sent to the pathologist for evaluation who will opine if the tissue is representative of the lesion and adequate for a final diagnosis. 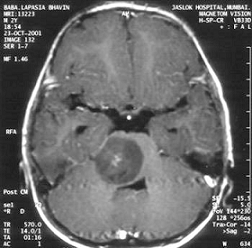 Post-operative CT scan to rule out any haemorrhage and also to confirm the site of biopsy. The patient is kept under observation for following the procedure and usually goes home within 1-2 days.